SUMMER ENTERTAINING: DECOR — The Event Firm Inc. HOST AN EVENING THAT'S ONE IN A MELON! The summer months seem to arrive so unexpectedly and then escape us just as quickly. To be able to fully enjoy your summer and all of it's perks, get out and quite literally stop and smell the roses! Take the time to finish that novel you started in March that with life being so busy, you just never had the opportunity to finish. Buy that new dress you saw online or at one of your favourite boutiques that without that summer glow you felt unworthy. Purchase that bottle of sparkling that you saw on display at the LCBO but thought, hmm when will I actually have the chance to drink this. Do it all! Say yes to summer! The best part about summer? It wants to be shared! Share these sunny days and warm relaxing nights with company. Host that dinner party you've been too busy to plan, download that new playlist, and make it happen! Hosting, for me is always a "thing". I have to be super prepared, given tons of notice, and I require a schedule to fully allow myself to ease into what's to come. My mother-in-law assures me that the more I host, it will come more fluidly and in time it will become like second nature to me. I worry about everything; how clean the house is, do we have enough food, what if they don't like the beverages I've chosen, where is everyone going to sit... It's an ongoing battle, but I'm getting there. What helps me is the creative planning. I actually really enjoy the initial process, even though its completely stressful. Researching fun, trending ideas, shopping for items, making lists and seeing the whole vision come together. When you're decorating for an outdoor/ backyard party or indoors for that matter, there are no rules. Choose a colour scheme that works for you and run with it. To me summer is bright, loud, vibrant, so I like having warm tones in my creative atmosphere. I also think of white, clean, refreshing, pale pastels, pretty, delicate as I'm reminded of the Hampton's and their classic white parties. When you initially get the idea to plan a dinner party, what inspires you? Is it an image you saw online, unique glassware you spotted at Home Sense or an innovative cocktail recipe you tried uptown? Whatever it was, yes! Here are some of our favourite summer inspirations. This summer use the item that is most always found in your home, and take it up a notch. Fruit! Fruit is colorful and can be used on so many levels. We like the idea of using fruit to fill space. Create a bold table runner and use fruit as the filler or as the focus! 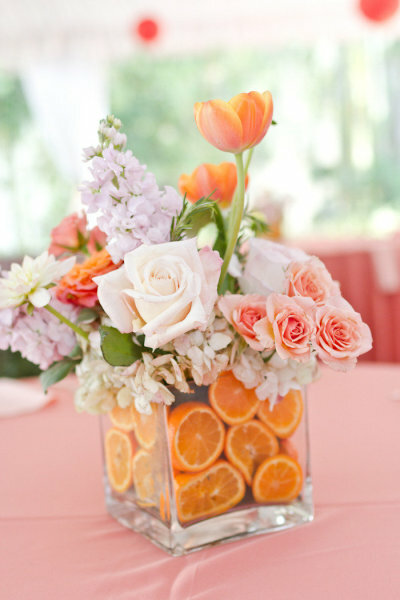 Take a simple orange and create a stunning visual masterpiece around it. Give your guests something to be in awe of and set the standards for an awesome dinner party. The idea of using produce doesn't just stop with a table runner. Fruit centerpieces are stunning and you can do them yourself. Don't feel artsy? Call your local florist. I'm sure they can do it for you tool Just make sure to explain your visions to them, so they can bring it to life - pictures really help. Here are some of our favourite fruit inspired centerpieces. Tall vases filled with fruit and florals are easy to do, and the cost of produce can reduce the overall cost of the project! Have the time to get super crafty? Not only is this a conversation piece but it's a definate win for your dinner party! We spotted these fun "fruit vases" and couldn't resist. What do you think? Something that interests you? Lastly, the simple concept of using fruit in your place setting. It's so charming and cute but classy all at the same time. I love how simple pear or lemon cut or full can look so elegant on a dinner plate waiting to greet it's guest. We're just going to leave the image below here because it screams summer and is so perfect for a brunch, a dinner party, or any summery occasion! Take a clear glass or tall vase, fill an ice cream cone- preferably a waffle cone with fresh florals or fruit and place it into the glassware of your choice! Fill bottom of glass with gems, gel beads, rocks, shells, sand or leave it as is! This do-it-yourself craft is so visually stunning and so simple to make as a centerpiece or to place by each of your guest's place setting. Let your imagination take over and remember to have fun while creating! 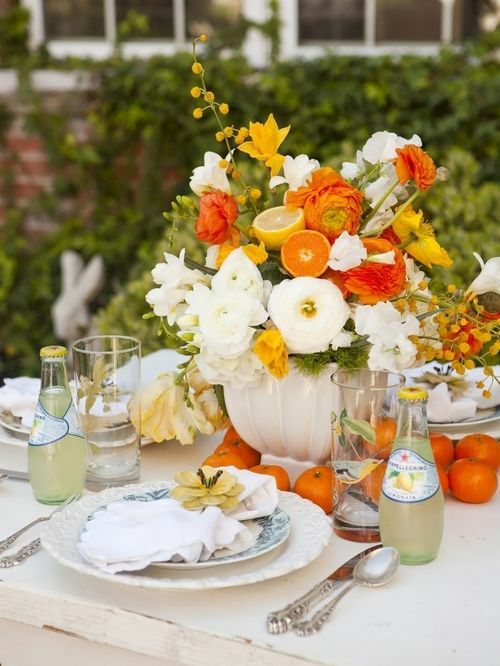 Fill your summer days and nights with citrus inspired decor, spend time at your local farmers market discovering new ways to create and present stunning masterpieces and remember to take the time to indulge in your summer fruit filled fantasies!